Nebraska landed another commit from the junior college ranks on Wednesday evening. 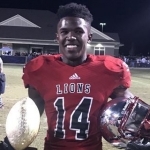 Wide receiver Mike Williams from East Mississippi Community College announced his commitment to the Huskers via Twitter. Williams picked up an offer from Scott Frost and Nebraska’s coaching staff on Sunday afternoon. He graduated from East Mississippi CC in December, and will enroll in classes at UNL this month. Williams will join the team for spring practices. Williams began his career at Georgia Southern in 2016 before joining the junior college ranks. This past season at East Mississippi, Williams finshed with 669 receiving yards, seven touchdowns and 30 receptions. He averaged a team-best 22.3 yards per catch. Williams had interest from schools like UCLA, Tennessee and Texas Tech, but did not receive an offer from any of those three. Williams is the 15th commit of Nebraska’s 2018 recruiting class. The Huskers now have three receivers in the class, including Justin McGriff and Jaron Woodyard, who’s coming in from Arizona Western College. According to 247Sports.com, Nebraska’s 2018 class ranks 38th nationally and 9th in the Big Ten.